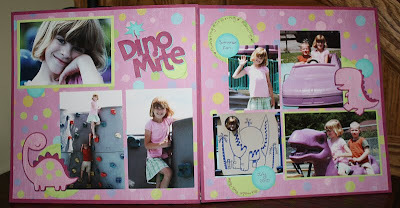 Remember that scrapbooking retreat I went to last spring? If you recall, I made a bunch of layouts without the titles, journaling, or embellishments. It has been so nice to have these unfinished layouts on hand for those times when I just want to play for a little while and don't have time for a big project. I just grab a Ziploc bag with a layout in it & finish it off. Such a great sense of accomplishment in a short amount of time. This layout is for my daughter's book. The kiddos were playing at a park with a lot of dinosaur themed activities, so I used that for inspiration for my layout. I repeated the circles & colors from the background paper using cardstock circles for the journaling and to accent the photos and die cut dinos. The dinos & title were cut using the Cricut Create a Critter cartridge. I really like the way this layout came together. It's so playful and reflects the fun they had at the park together. I finished another layout, and I have a new card to share, so be sure to stop back tomorrow.